Hutchinson, K., Swart S., Ansorge I. J., Goni, G.
Hydrographic data from three research cruises, occupying the GoodHope line in the Atlantic sector of the Southern Ocean, are used to identify and quantify Expendable Bathythermograph (XBT) temperature biases. A set of 148 collocated XBT and CTD stations, separated by a maximum distance of <12.5 nm and <10 h, are used in this study. A subset of these comparisons is also investigated. This subset consists of 24 simultaneous pairs where the XBT and CTD stations are within 2.5 nm and 2 h of one another. These simultaneous pairs are extremely rare in XBT bias experiments and provide data set to assess, in deeper detail, the behaviour of the bias. The net bias, which is a product of both the depth offset and the pure thermal bias, is investigated with depth per frontal zone for both the collocated and simultaneous comparisons and found to be on the whole positive, meaning warmer XBT readings compared to the CTD values at each depth. The total mean bias for all collocated pairs was found to be 0.101 +/- 0.024 1C, and for the simultaneous subset the net bias had a mean value of 0.130 +/- 0.064C. An investigation into the magnitude of the depth offset was also undertaken, exposing generally positive depth biases, thereby indicating an overestimation of depth by the fall rate equation. A sizeable variation in bias between frontal zones is observed, along with an expected increase of net bias in regions of steeper temperature gradient. The contribution of the pure thermal bias is explored and found to be comparatively small yet still sizeable (mean bias = 0.053 +/- 0.063C). Results found in this study further support the hypothesis of the regional dependence of the XBT fall rate on water temperature, and thus water viscosity. In addition, results obtained here highlight the need to develop an XBT bias correction scheme specifically appropriate to the Southern Ocean. 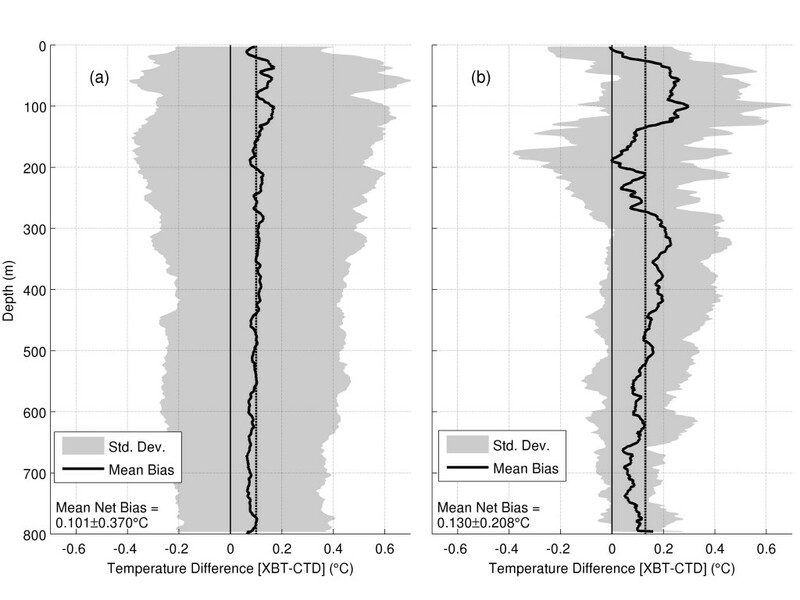 Mean net temperature bias with depth for (a) collocated pairs and (b) direct comparisons. The standard deviations are illustrated with grey shading, the solid back line is the mean bias and the dashed black line is the full-depth mean bias. J. Geophys. Res. Oceans, 122, doi:10.1002/ 2016JC012494. Geophys. Res. Lett., 43,9192–9199, doi:10.1002/2016GL069973. Geophys. Res. Lett., 42, doi:10.1002/2015GL066009. ICES Journal of Marine Science, 2015, doi:10.1093/icesjms/fsv105. The seasonal cycle of mixed layer characteristics and phytoplankton biomass in the Sub-Antarctic Zone: a high-resolution glider experiment. Journal of Marine Systems, 2014. doi: 10.1016/j.jmarsys.2014.06.002. Journal of Geophysical Research, 2014, 119, 1123–1145, doi:10.1002/2013JC008908. Geophysical Research Letters, 2012, vol. 39, doi:10:1029/2012GL052454. Regional scale characteristics of the seasonal cycle of chlorophyll in the Southern Ocean. Biogeosciences, 8, 2849-2866, doi:10.5194/bg-8-2849-2011. 2011.
International Journal of the Society for Underwater Technology, 2012, Vol 30, No 3, pp 135–149. Journal of Geophysical Research, 2010, 115, C03002, doi:10.1029/2009JC005299. Journal of Geophysical Research, 2010, 115, C03003, doi:10.1029/2009JC005300. European Space Agency Publication, 2010, WPP-306, 19 pp. Journal of Geophysical Research, 2010, 113, C09014, doi:10.1029/2007JC004223.